Borussia Mönchengladbach issued Guardiola’s first Bundesliga defeat of the season with a resounding 3-1 victory at home to the German champions. Schubert opted for a flexible 3-1-4-2 system over his more usual 4-4-2 which saw Granit Xhaxa act in a hybrid defensive role between the lines of defence and midfield. How the two systems matched up. Yann Sommer took on the role of goalkeeper and was protected by a back 3 of Nico Elvedi, Andreas Christensen and Havard Nordtveit from left to right. Just ahead of them was Xhaxa who played as a 6 or in the defensive line situationally. In central midfield was Mahmoud Dahoud on the right of the trio and goalscorer Fabian Johnson took to the left of that. They were flanked on the wings by the impressive Oscar Wendt who scored the opener and Julian Korb. In attack, both Raffael and Stindl threatened, the latter converting the 2nd of Gladbach’s goals for the day. Much talk has been made of Guardiola’s selection recently as he rotated his selection again, this time using quite a standard 4-3-3 shape. Manuel Neuer was ever-present behind a back four of Rafinha, Benatia, Boateng and Lahm. Xabi Alonso was the lone pivot with two 8s ahead of him in Vidal and Martinez, the latter playing surprisingly high up the pitch. The front three consisted of young Coman on the left, Lewandowski down the middle of the attack whilst Muller took to the right side of the pitch. One of the key features of Gladbach’s system in defence was the orientation of their defensive line. Schubert’s side played with a pendulating back four in their 3-5-2, with the full-backs moving between the defensive line and the midfield chain dependent on ball position and phase of play. As SV-colleague RM states in his article explaining the different types of defensive lines, a pendulating back four is where a chain of 5 defenders incorporate features of not only a back 3 and 5, but also have strong elements of a 4-man defensive line too. The 3 central defenders generally stay the same with perhaps slightly more of a shifting action performed by the ball-near centre-back though the full-backs have some unique movements in defence. The ball-near full-back will push up towards the ball, moving out from the defensive line and putting pressure on spaces higher up, usually in accordance with some man-oriented defensive schemes in wide areas. In co-ordination with this, the ball-far full-back will then push into the defensive line and as the chain shifts, a back 4 is formed. Through executing these movements, Gladbach were more easily able to maintain a ball-oriented shape with the necessary pressure in possession, whilst the spatial compactness was improved through the actions of the ball-far full-back. The ball-far full-back had some other interesting movements too during Bayern’s possession in midfield. When the ball was far on the opposite flank, he would often come inside almost into the position of a central midfielder to help aid the spatial compactness and provide support for a sometimes isolated Xhaxa. This was more common in situations where either Dahoud or Johnson (or both) had moved away from central midfield to press so the support of the ball-far full-back was important to maintain stability in these areas. Here we can see Korb move into midfield to maintain spatial compactness in the 6 space. In typical Borussia Mönchengladbach style, Schubert’s team were nicely compact and although perhaps not to the extent of their 2-0 win last season, did well to control the dangerous spaces during Bayern’s attacks. Their ability to maintain this compactness was threatened at times when Dahoud and Johnson couldn’t co-ordinate their press well as their man-marking could see them dragged out quite far. 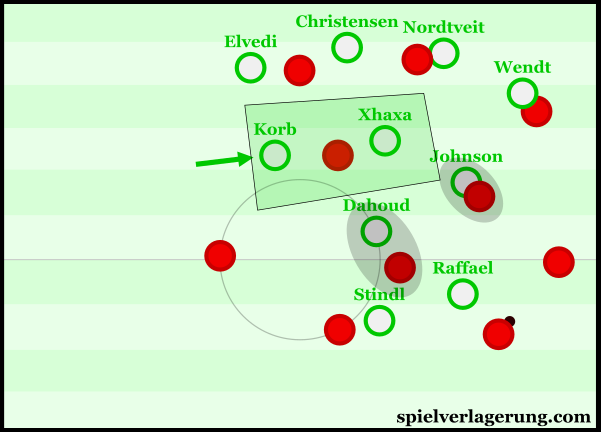 This left Xhaxa with a large amount of space to cover and he had to call on the support of the disengaged full-back as shown above. Particularly crucial to the defensive organisation of Gladbach was Granit Xhaxa. Selected on the teamsheet as Schubert’s defensive midfielder in his 3-1-4-2, the Swiss midfielder played a versatile role which saw him perform the standard responsibilities of a CDM but also perform as a centre-back when the situation required it of him. He was highly competent in this complex role and played a big part in a Gladbach defence which, despite leaking some chances in the first half, contained a Bayern attack better than most this season. The midfielder would drop between the defensive line usually to maintain numerical superiority against the Bayern attack whilst Korb and Wendt were still nearer the midfield chain. If the two full-backs had dropped into the defensive line instead then it would’ve made for a 5v3 matchup leaving Gladbach with a surplus defender, weakening their occupation of spaces higher up. However with Xhaxa dropping inside instead they could create a 4v3 which provides better numerical stability across the whole block. 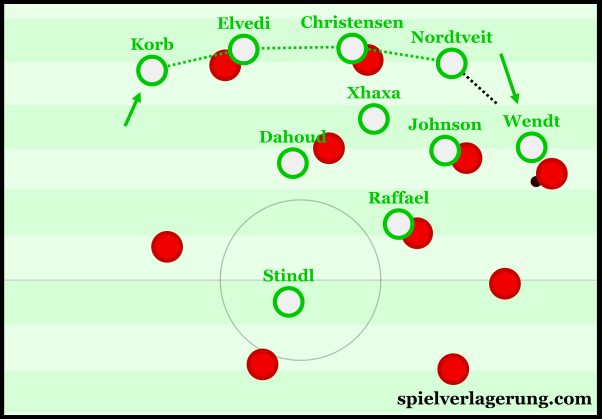 This was particularly important when Bayern looked to stretch the Gladbach defence through the wide positioning of the front 3 who, when matched up against the chain of Elvedi, Christensen and Nordtveit, would stretch Gladbach’s defensive line wide. During these movements, Xhaxa would drop to one side of Christensen to not only provide the advantage of the extra defender, but to help close up the spaces between the 3 centre-backs. Michael Caley’s xG map of the tie. 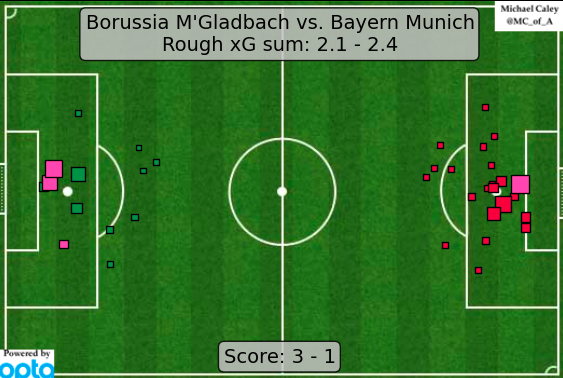 Despite the strong defensive attempts from Gladbach, Bayern still managed to create a number of dangerous chances, especially within the first half. This resulted in Guardiola’s side generating a total of 2.4 xG which correctly suggests they undershot on the day with a lack of clinical finishing from forwards such as Lewandowski and Coman. Another telling implication from Michael’s tweet shows the defensive weakness of Bayern in this tie as before this match they had conceded just 0.47 xG per game. Credit must be given to a strong Gladbach attack who countered well, using local combinations to great effect in 2 of their goals as they displayed excellent decision making in and around the box. 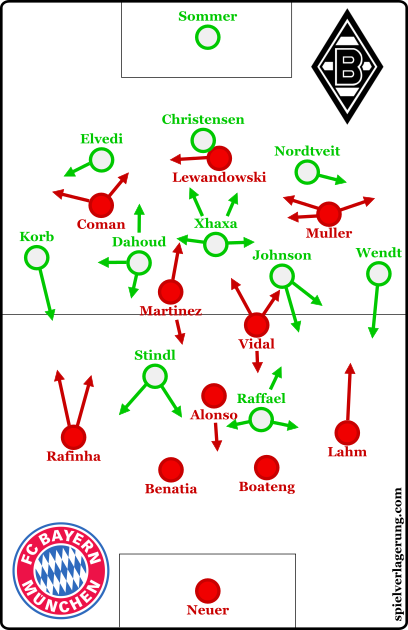 As Gladbach added to their lead, Guardiola progressively encouraged a more attacking focus from his team as he moved them towards a 4-2-4 shape with the introduction of Rode and later Ribéry. As happens often during such scenarios, there were few fixed positions as players such as Martinez, Vidal and Coman moved forward with urgency in hopes of a way back into the game. Despite the Frenchman’s well-taken goal, Gladbach held out for their 3-1 victory and produced the shock result of the weekend.